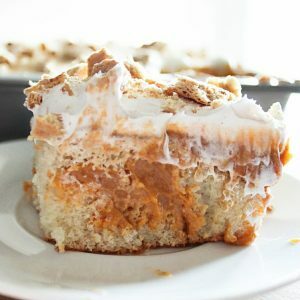 You only need a few simple ingredients to whip up this super easy and tasty Pumpkin Pie Poke Cake! It’s sure to be a hit at your next Fall get together. Are you tired of pumpkin yet? Me neither. But this will be the last pumpkin dessert that I share with you this pumpkin season. I know, I know, I am just as sad as you are. Truth is, there is only so much pumpkin I can throw in to my baking before my husband looks at me like I’ve completely lost my mind. Even if he secretly loved this Pumpkin Pie Poke cake I’m about to share with you. Yes you read that right. 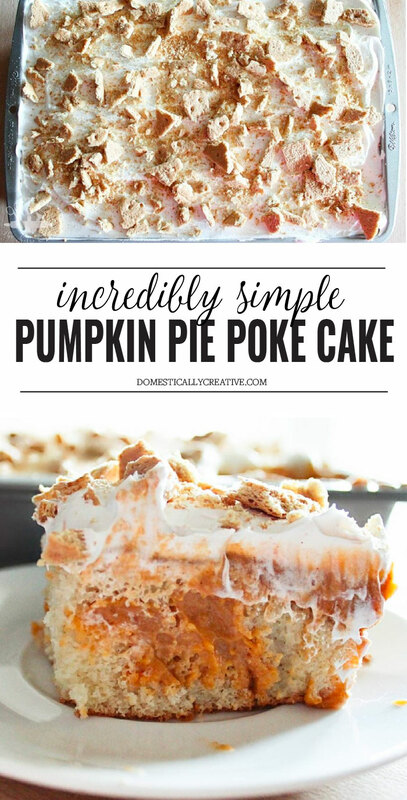 Pumpkin pie–in poke cake form. 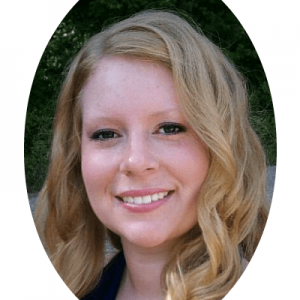 I am all about easy–easy crafts, easy food, easy decor–which is why poke cakes are top on my list of things to make. Never heard of a poke cake before? That’s OK, up until a few years ago I hadn’t either. It was actually my mom who surprised me by making one for a cookout. We had no dessert to bring, and not much time to whip something up. She pulled out a white cake mix, and a box of Raspberry Jello, and declared “I’ll just make a poke cake”. A poke cake is literally when you bake a cake, and before it cools you take a skewer or some other poking capable device, and poke holes all over it. Then you pour jello(or pudding in this case) over the cake before it sets. Top with Cool Whip and BAM–you just made a poke cake. Easy. Am I right? 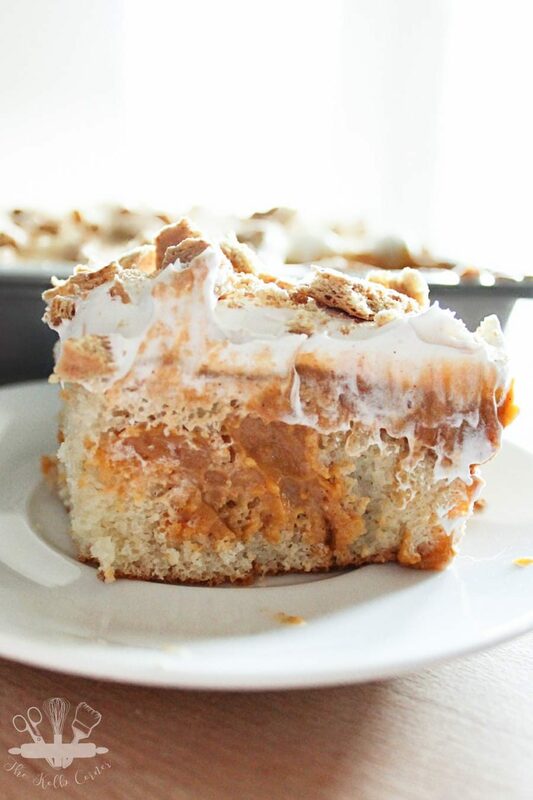 This Pumpkin Pie Poke Cake is just as easy. 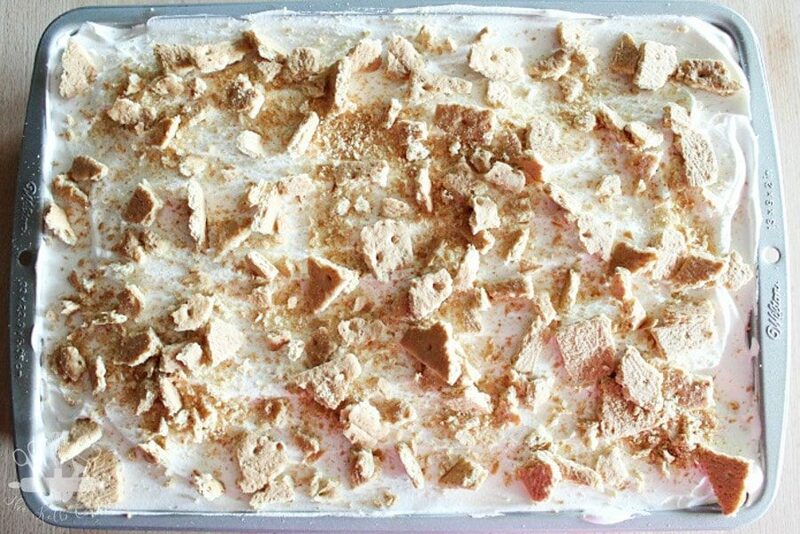 Trade the jello for the seasonal Pumpkin Spice Pudding (yes it does exist) and sprinkle some crushed graham crackers on top of the Cool Whip. It’s the easiest pumpkin pie you’ll ever make. Trust me. Prepare cake according to directions on box. Once cake has fully baked, using a skewer or wooden spoon handle, poke several holes in baked cake. Let cool. Prepare pudding mix according to instructions on box. Pour mixture over cooled cake, making sure to get mixture in the holes. Cover and refrigerate until pudding is set. Remove from refrigerator and frost cake with Cool Whip. 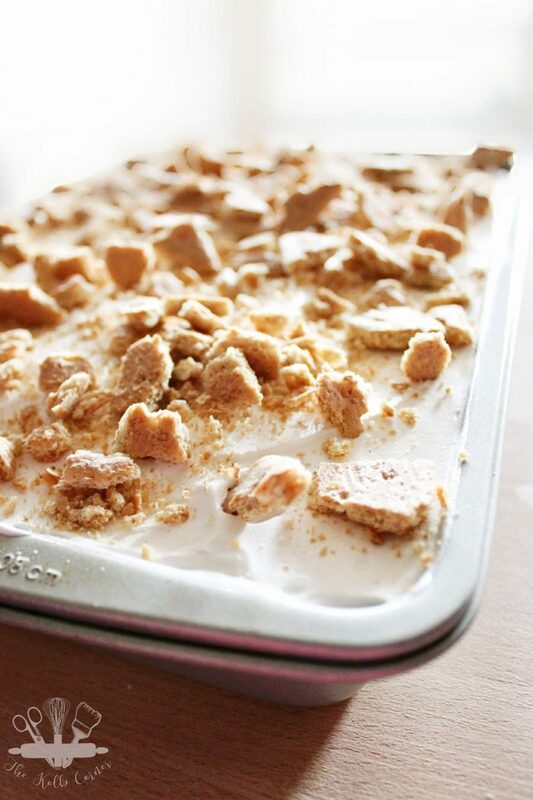 Top with crumbled graham crackers. I always poked holes when cool, just before adding the jello.